As it has been a little while since we've shown one of our popular 'Before and After' series, I thought I would share one from our good friends at Murals by Jericho (MBJ). This particular renovation took place at St Mark's Catholic Church in Peoria, Illinois and was the first full scale church renovation done by MBJ; one that, by all accounts, was a smashing success. 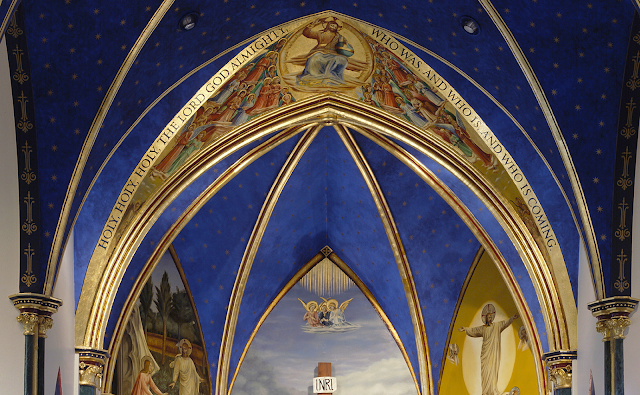 The renovation included some twenty four paintings, some of which were adaptations of the works of Fra Angelico, and others that were completely original but utilizing a similar style. Other features of the restoration work include the use of trompe l'oeil and the restoration of some of the original marble finishings, including the original altarpieces. "This project started as a single commission for the Coronation of the Virgin painting and ended up a full redecoration and renovation. After we met with [the parish priest] and he could see what we might be able to accomplish, he commissioned the Coronation painting. He loved the first painting and started raising money to add others. "We found that there was a terrazzo floor under the orange commercial carpeting. 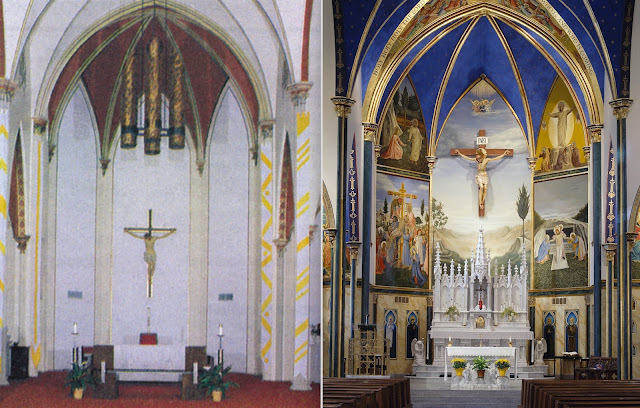 We also found out during our work there that a friend of ours had rescued the original marble altars that were discarded in the 1970's when they modified the interior. He gave the altars back to the church when he found that we were properly renovating the church. 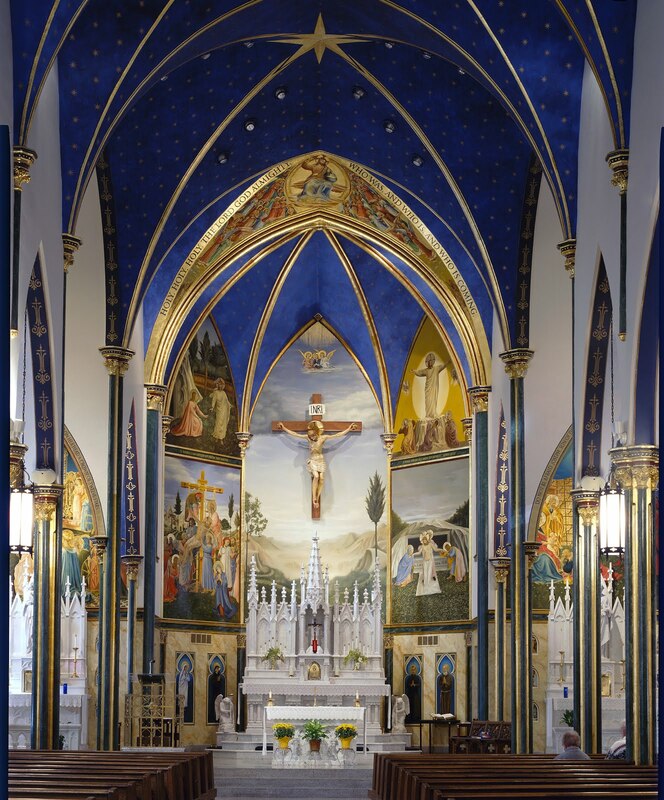 With the help of parishioners and a friend in the stone and marble business, we were able to restore the sanctuary furnishings to their original glory. "The then newly appointed Bishop Daniel Jenky (Peoria Diocese) dedicated the church as a shrine of Blessed Fra Angelico." Without further ado, what you are all waiting for; the images. 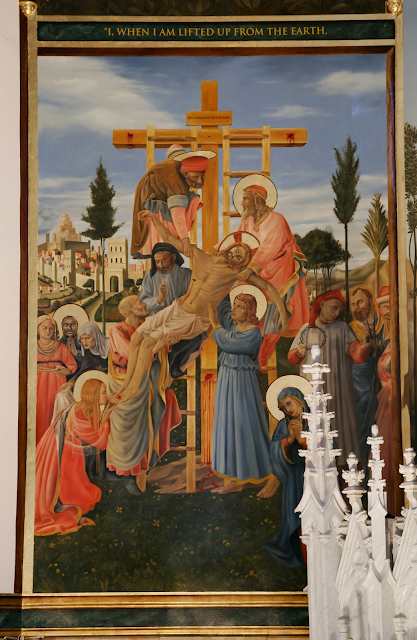 A stunning transformation to say the least, and one that certainly reminiscent of the colourful medieval Franciscan artistic tradition within Italy. 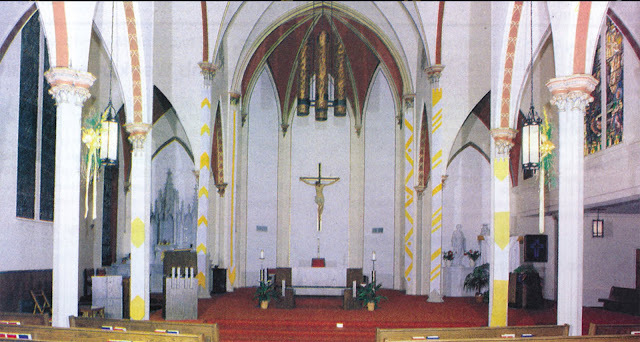 What is particularly striking to me in this design is the wonderful integration of the altar and crucifix with a naturalistic backdrop that frames the crucifix nicely and also keeps attention focused on it and the altar. 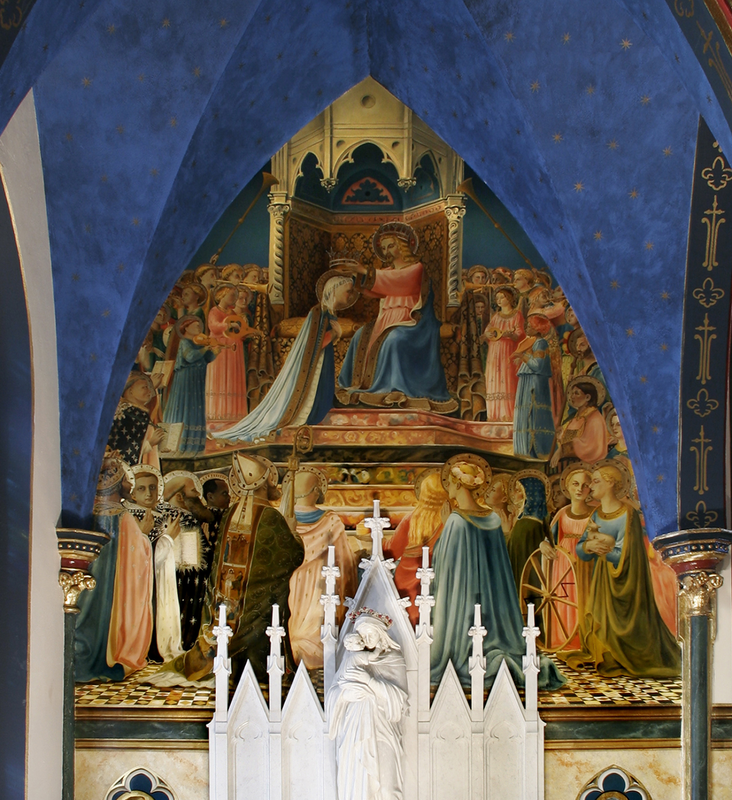 Given the broad array of colours found here, the white altar and reredos also work very well, setting it into contrast from the mural work. 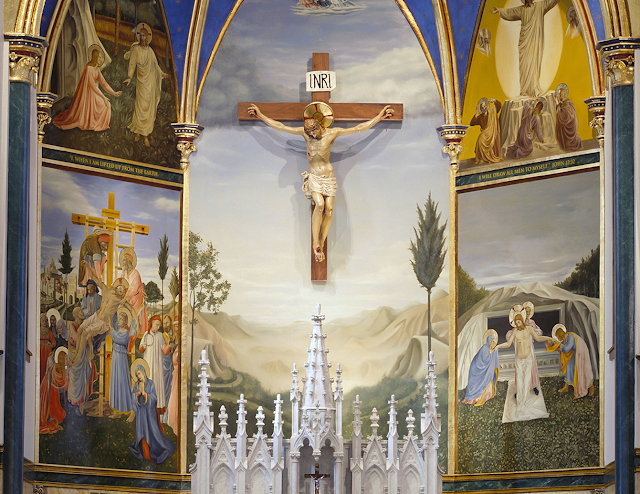 The scenes on either side also help to frame the altar and crucifix while providing additional artistic interest and theological content.